The Glasgow Coma Scale (GCS) provides for the straightforward and rapid assessment of the conscious state of a patient suspected of having recently experienced injury to the brain. 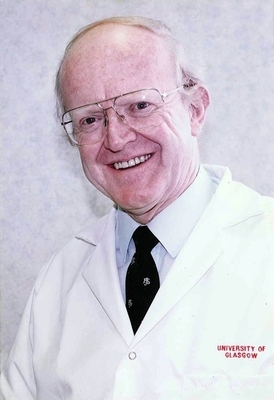 The GCS was developed by two internationally recognised neurosurgeons, Professors Emeritus Sir Graham Teasdale and Bryan Jennett (1926-2008) working at the Southern General Hospital in Glasgow. Over the succeeding years the GCS became an enduring integral part of clinical practice and research across the world. 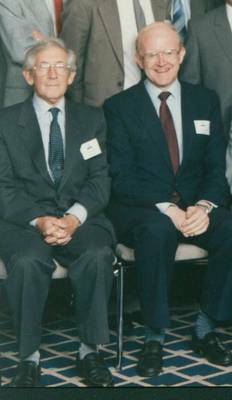 In 1974, Teasdale and Jennett published a paper in the Lancet, entitled "Assessment of coma and impaired consciousness: a practical scale". This provided a schema for the assessment of graded responses in three behavioural domains - opening of the eyes, the capacity to communicate verbally and a motor response to move parts of the body after a command or physical stimulus. A patient suffering from an acute brain injury is assessed by their response in each test. If one test is not available, for example because of swelling around the eyes or breathing difficulties, the others are still available. The effectiveness and ease of use is shown in that the GCS soon became utilised world-wide in Neurosurgical Units and in Accident and Emergency departments. It has been translated into more than 60 languages and the 1974 paper is the most highly cited in clinical neurosurgery. Numbers assigned to the steps in the responses can be summated into a total score. The maximum score attainable by a patient is 15, the minimum score is 3. The summated value has a strong correlation with the outcome for a patient and is used in research and in classifying patients. A total score between 3 and 8 indicates a severe injury to the brain which will have a poor prognosis, between 8 and 12 a moderate injury and between 13 and 15 a mild injury. The great majority, more than 85%, of patients admitted to emergency triage appear to have mild head injury and of these about half will make a full recovery. Sir Graham Teasdale is an Honorary Professor in Mental Health and Wellbeing in the Institute of Health and Wellbeing. He was previously Professor of Neurosurgery, Head of the Department of Neurosurgery and Associate Dean for Medical Research. A graduate of the University of Durham (MB BS 1963) he held junior hospital posts in Newcastle upon Tyne, London and Birmingham before coming to Glasgow as a lecturer in Anatomy 1967. He held training posts in surgery and neurosurgery at the Southern General Hospital before becoming successively Senior Lecturer (1975), Reader, Professor and Head (1981–2003) of the University's Department of Neurosurgery. Along with Brian Jennett, he created the Glasgow Coma Scale, or GCS, which is used in every hospital around the world to give a reliable, objective way of measuring the conscious state of a patient. Sir Graham was President of the Royal College of Physicians and Surgeons of Glasgow from 2003 until 2006. He was knighted in 2006 for his services to neurosurgery. Teasdale, G. and B. Jennett. 1974. Assessment of coma and impaired consciousness. A practical scale. Lancet. 2: 7872: 81-84. World Changing Project, "Developing the Glasgow Coma Scale," in University of Glasgow World Changing (University of Glasgow, 2010); http://www.worldchanging.glasgow.ac.uk/article/?id=9 (accessed April 26, 2019). World Changing Project. "Developing the Glasgow Coma Scale." In University of Glasgow World Changing. University of Glasgow, 2010. http://www.worldchanging.glasgow.ac.uk/article/?id=9 (accessed April 26, 2019). World Changing Project. "Developing the Glasgow Coma Scale." University of Glasgow World Changing. University of Glasgow, 2010. 26 April 2019 <http://www.worldchanging.glasgow.ac.uk/article/?id=9>.